Unfortunate Day at the State House! 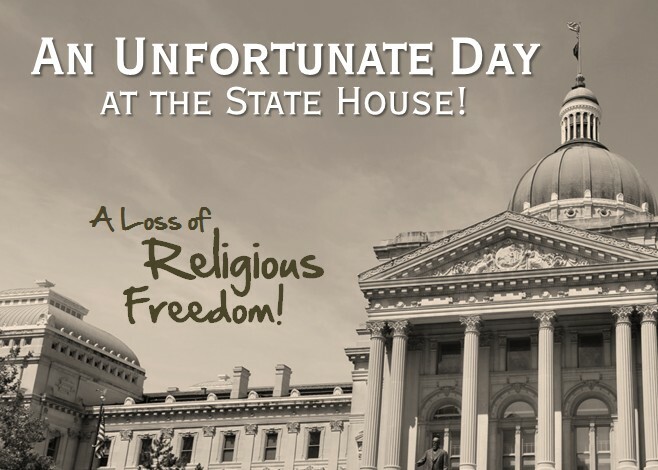 Last Thursday, April 2nd will be remembered as the day when religious freedom suffered a major loss at the Indiana State House. Religious Freedom lost when the Indiana House of Representatives and the Indiana State Senate passed Senate Bill 50 and Governor Mike Pence signed it into law. Since last Thursday I have been contacted by people around the state regarding what happened to bring about the passage of Senate Bill 50 that resulted in a loss of religious freedom. Senate Bill 101 Protected Religious Freedom! Senate Bill 50 was a response to Senate Bill 101 which passed earlier in the legislative session. Senate Bill 101 is the Religious Freedom Restoration Act (RFRA). It is similar to laws in 30 other states and to the Federal RFRA. SB 101 is not about discrimination! SB 101 is about protecting religious freedom by providing a guideline for courts to use when the government would try to force an individual, a business or an organization to do something that would violate a sincerely held religious belief. “The Indiana law is based on the 1993 federal Religious Freedom Restoration Act – a law that has served the America people well for more than 20 years. Passed with 97 votes in the Senate and by unanimous voice vote in the House, the federal Religious Freedom Restoration Act was signed into law by then-President Bill Clinton. This federal law prohibits substantial government burdens on religious exercise unless the government can show a compelling interest in burdening religious liberty and does so through the least restrictive means. 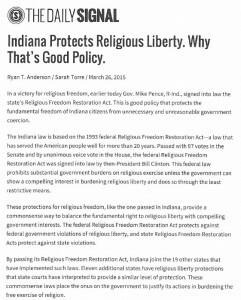 (Click Here) to read the rest of Ryan Anderson’s article about Indiana’s RFRA. Then Senate Bill 50 Was Passed! Senate Bill 50 removed most of the religious freedom protection found in SB 101. This means that Indiana’s RFRA would not be available to help protect the religious (Christian, Orthodox Jewish person, etc.) baker, florist or photographer from being forced by the government to participate in a homosexual wedding. To take away this protection from religious individuals and businesses was wrong! Be watching for an upcoming email where I will discuss why religious freedom was lost at the State House on April 2nd. It didn’t have to happen!